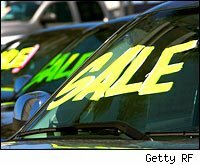 Auto dealers are trying to avoid the ultimate going out of business sale. Chrysler L.L.C., by far the weakest of the Big 3 automakers, Thursday announced plans to end its relationship with 789 dealers by June 9, representing about 14 percent of its sales volume. On Friday, General Motors, which eventually plans to shrink its dealers by a whopping 40 percent, told 1,100 under-performing GM dealers that their franchise agreements will not be renewed next year. The moves were done at the behest of the Obama Auto Task Force. The National Automobile Dealers Association has begun a full-court press against the closings, lobbying both members of Congress and the Auto Fask Force which feels these cuts are vital to insure the long-term survival of the industry. NADA's ads have appeared in Automotive News, The Washington Post, Roll Call and the Chicago Tribune and Chicago Sun-Times. "A rapid reduction in dealer numbers would further CUT manufacturer revenue and market share and do NOTHING to improve the manufacturer's viability in the short-term," according to the NADA,which estimates that 150,000 jobs could be lost through the cutbacks. The secondary impact would also be huge since dealers are big cogs in the economies of small towns, supporting everything from local parts suppliers to the local newspapers to little league teams. These businesses have often been owned by families for generations. Getting people to do business with another dealer in a nearby town may prove to be more difficult than expected. But the problem according to many experts is that there are too many dealers and too few sales of American cars, giving the car companies little choice but to sever ties with companies it has done business with for decades in some cases.